Tonight is pizza night for us. And Thursday nights will be for a while, at least the next couple of months. And, it all has to do with….swim lessons! Both of our kids have attended a not-for-profit co-op preschool during their age appropriate years. In order to keep tuition low, they do various fundraisers, and the biggest one has always been a silent auction held in March. One of the items that has always been donated is a month membership to a nearby swim school. We have bid on it and been lucky enough to win every year. It usually saves us a bit of money for at least the free month compared to the regular tuition, plus we get some accessories like goggles and such. This year, we found ourselves with two month passes to use, as we won both last year and this year, and hadn’t yet used either one. Both of our kids have had great times and learned a lot there, so we decided to enroll them each in swim lessons. This worked out great because you can only use one month per child. As it so happened, we were able to schedule their lessons at the same time, which is 4:30pm on Tuesday. This means a pretty mad scramble to get ready and get there after our son gets off the bus at 4pm. My wife and I both like to go and watch how they’re doing, plus at their ages (6 and 4), getting them cleaned up and changed afterward is definitely easier when you split the duties. The lessons are about half hour, and by the time we’re done getting everything ready, often another half hour or so has passed. This puts us squarely at dinner time. My wife and I decided, in a pretty short conversation, that pizza would be a great fit for Thursday nights. We’re not fancy when it comes to pizza, so we have a few different options on the way home. We like Little Caesar’s, either the $5 round or $8 deep dish pizza. Last week Domino’s had a coupon code where we got 50% off, so that’s what we had. 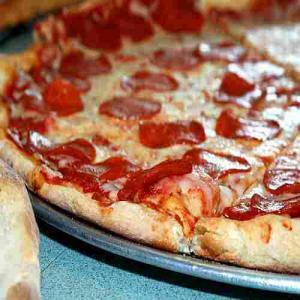 We also have Papa Romano’s, Papa John’s, and Pizza Hut all on the way or not too far off the direct path. If needed, we’ll order the pizza in advance and pick it up so that when we get home, all we do is throw together a salad. Then, we’re eating in no time! This is especially good with children who are hungry after their swimming! The tradition won’t last forever. We anticipate that we’ll run the lessons through May. By that point we’ll start getting busy with camping trips or other summer activities. Eventually, so the Thursday pizza night tradition will fade. But, for now it’s definitely a fun little family tradition, and not too expensive at all! Readers, do you have any ‘regular’ meals that stem from other things going on in life? That’s a good way to spend Thursday! By the way, congratulations on your discount on swimming lessons! When I was a kid, my family would stop by the Italian Market and buy crusts, sauce, sausage & mozzarella to assemble our own pizzas almost every Saturday night. We would watch a movie on TV (in the days when VHS rentals were new). Today, my wife & son & I often do the same thing. It’s probably a 30+ year tradition for us! How awesome to have such a long lasting tradition!